If you love the idea of a painted kitchen but just can't afford the price tag these designs tend to come with, take a look at the innovative Burford Paintable range from Howdens. 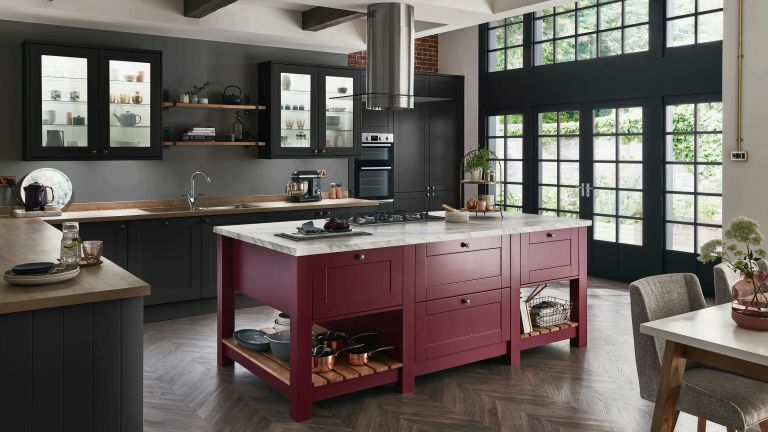 Fully customisable, this range of kitchen cabinets comes pre-primed and ready for your paint colour of choice, for example the vibrant Dulux Raspberry shade shown here. Howdens sells kitchens direct to the trade at trade prices; how much of that discount gets passed to you depends on your builder or kitchen fitter so, as always, ask for three quotes, or check whether you qualify for a trade account. Another way to get the hand-painted look at a cut price is to fit paintable kitchen cabinet doors and drawer fronts from Lark and Larks. Prices start at £7.97 for a primed kitchen door.